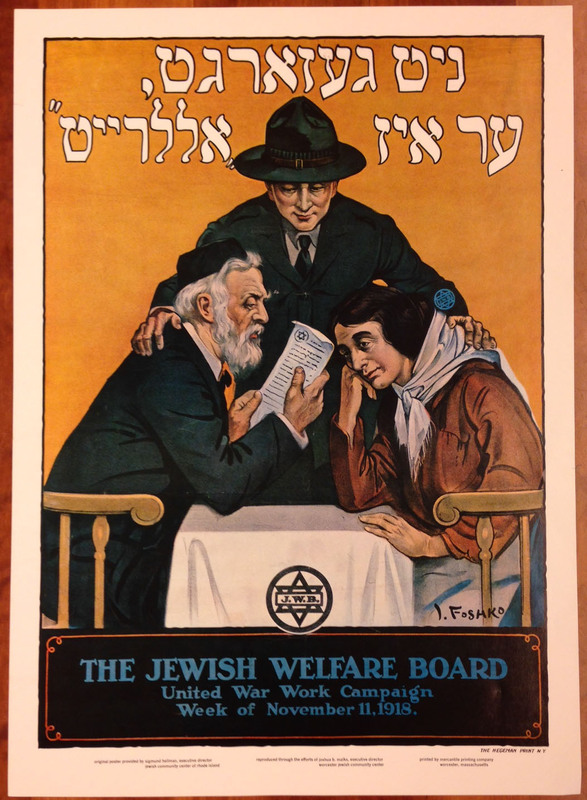 Among the Yiddish-language materials held in the William A. Rosenthall Judaica collection are three posters dating from World War I, one produced by the United States Food Administration and two produced by the Jewish Welfare Board. The Food Administration was the responsible agency for the rationing of food in the United States during World War I. 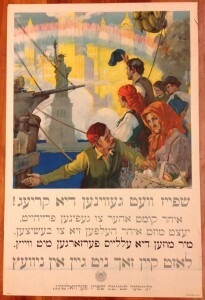 The Yiddish text on the following poster published by the Food Administration reads: “Food will win the war! / You came here seeking freedom. Now you must help to preserve it. Wheat is needed for the allies. Waste nothing.” The “Food will win the war” campaign, initiated by the Food Administration’s head Herbert Hoover, calls on immigrants to do their part for the war effort by conserving food. 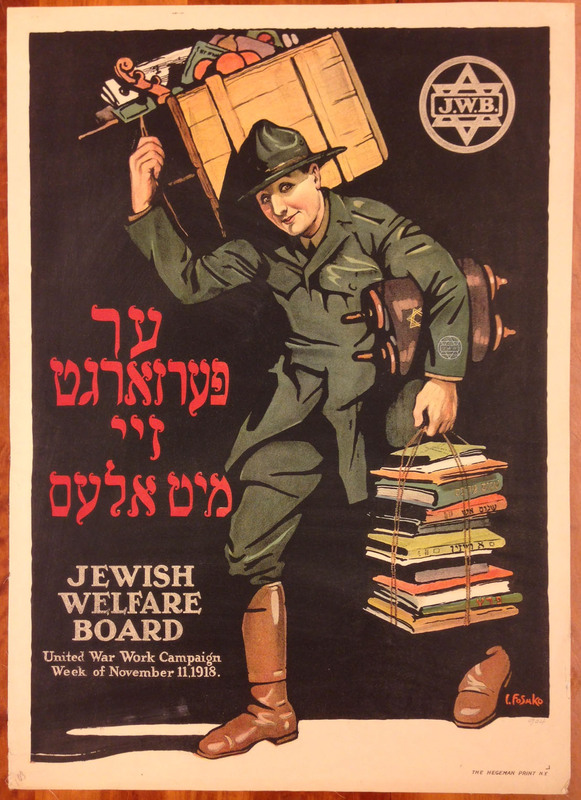 The posters of the Jewish Welfare Board, below, call for contributions to the war effort through the donation of funds to welfare organizations supporting both troops at the front and their families on the homefront. The Jewish Welfare Board (JWB) was formed at the beginning of World War I to “minister to the spiritual and recreational needs of all the men in the army and navy, but serving especially those of the Jewish faith.” In a pamphlet published by the JWB shortly after its founding, the organization described its purpose thusly: “To be with the Jewish soldier and sailor everywhere, aiding him, cheering him, inspiring him, serving him loyally and helpfully, and, through him, his country, and the ideals for which it stands.” From the perspective of the JWB, its “most distinctive vital function” was the “safeguarding and developing of the religious life and convictions of [the] men.” The JWB supported Jewish religious life through leading Sabbath and holiday services; supplying prayer books, prayer shawls, and tefillin; and providing kosher food. However, the JWB went far beyond these religious activities in providing for the welfare of Jewish troops. According to the organization, “Everything from leading a minyan to staging a boxing bout for the entertainment of the boys falls within the province of the Jewish Welfare Board workers.” Welfare workers provided classes in English, French, American history, and civics; organized literary clubs, concerts, dances, and athletic events; set up libraries in English and Yiddish; and visited sick and wounded soldiers in the hospital. Personal services of the JWB extended beyond the servicemen themselves to include home visits to the soldiers’ relatives. The many services of the National Jewish Welfare Board are on display in the above poster, printed for the United War Work Campaign. The United War Work Campaign brought together seven organizations–the YMCA, the YWCA, the American Library Association, the War Camp Community Service, the Knights of Columbus, the Jewish Welfare Board, and the Salvation Army–into one large funding drive charged with raising over $170 million for the war during the week of November 11-18, 1918. For more information on the Jewish Welfare Board, see Jewish Welfare Board, United States Army and Navy, co-operating with and under the supervision of the War Department Commission on training camp activities; purpose, scope, achievements.